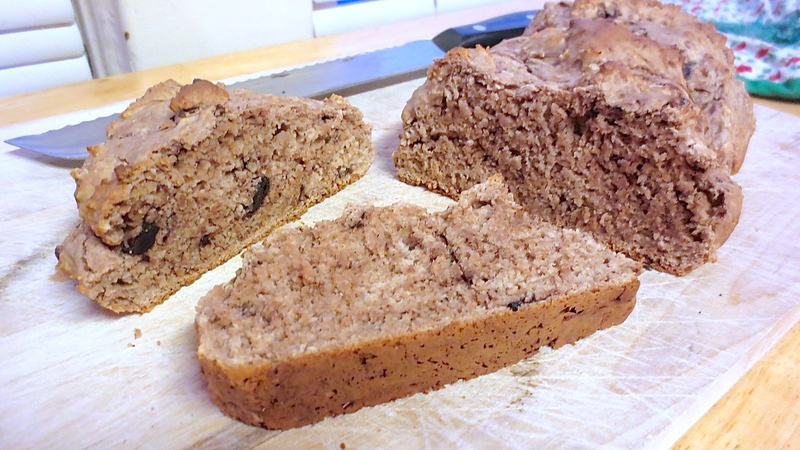 Ice Cream Bread: Simple as can be! I don’t know where I first saw it, but for the last month or so I’ve continually been stumbling upon recipes for “Ice Cream Bread” all over the internets. What is Ice Cream Bread, you ask? Well, it’s bread made out of ice cream. Sounds good, doesn’t it? Well, even better is this: the only ingredients are ice cream and self-rising flour. That’s it! Two frikkin’ ingredients. 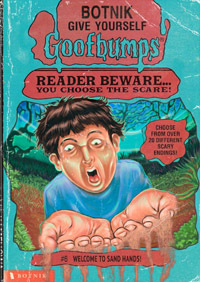 I just had to give it a try eventually. 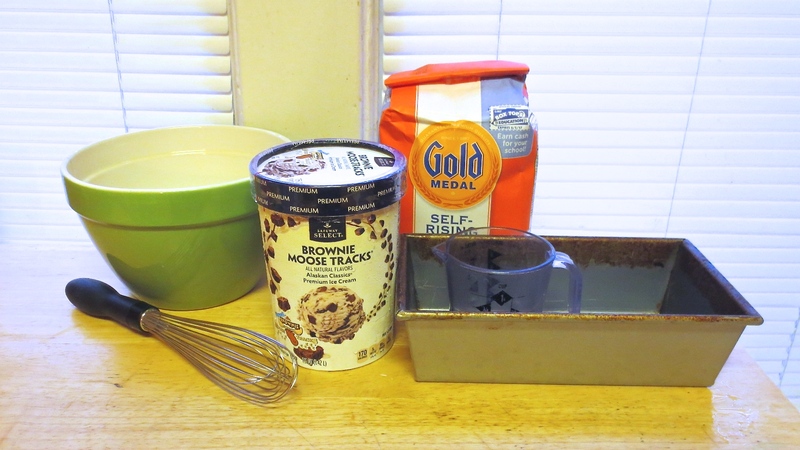 So I went out and got some nice Moose Tracks ice cream and some self-rising flour and got to work. That’s it! 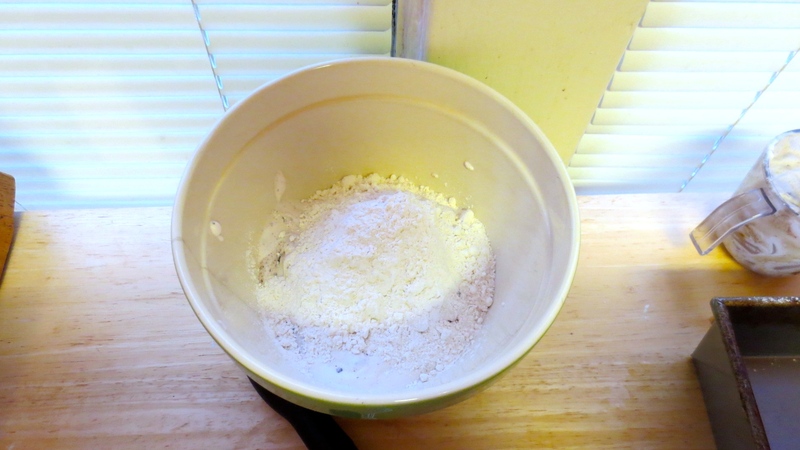 Mix those two ingredients together in a bowl until they seem like they’re mixed enough. 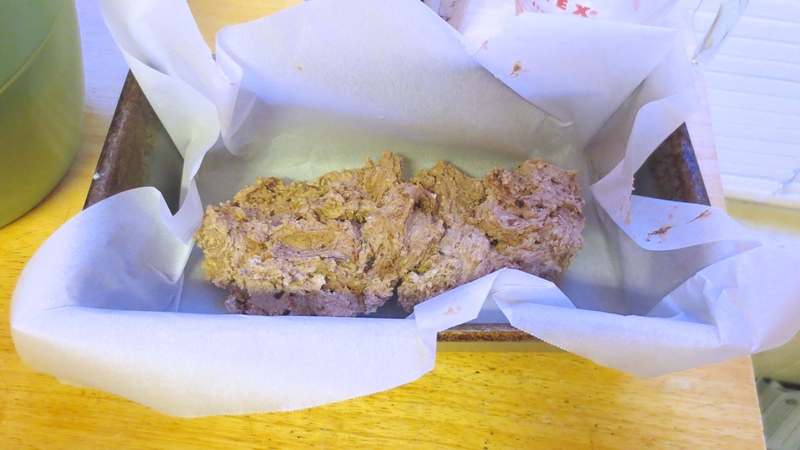 Either grease a loaf pan or line it with parchment paper and transfer the mixture into it. It’ll be pretty sticky and viscous. Just do your best. Then put it in a 350-degree oven and bake it until it’s done (until a toothpick stuck into it comes out mostly clean). It really took me only about 25 minutes to bake this loaf. Ice Cream Bread: Finished Product! Pop it out of the loaf pan and let it cool a bit. It ends up with kind of a soft-but crumbly consistency, somewhere between cake and sliced bread. It has a surprisingly subtle flavor, like bread that has been just tinted with ice cream, and just slightly sweet. Spread some butter on it while it’s still warm (or use the Japanese Better Butter Grater) and it is quite good. 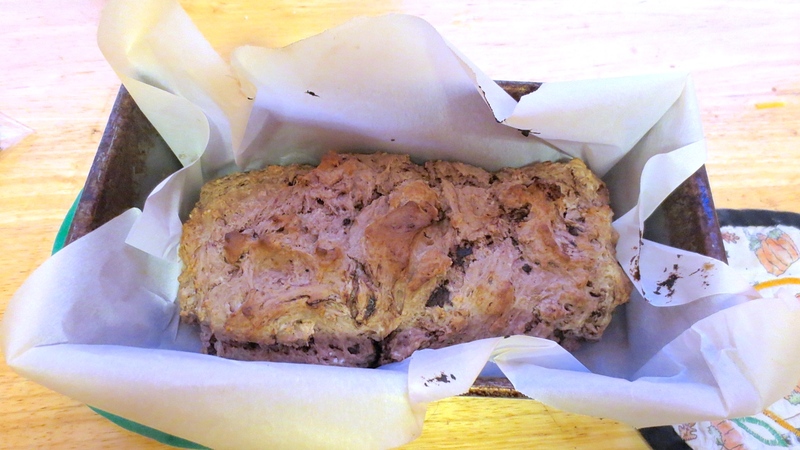 Ice Cream Bread = Yum + Easy! Next time I make it I might make a double batch. The self-rising flour didn’t make it rise quite as much as I expected it to. It’s not Earth-shattering, but for something that takes two ingredients and about a half an hour, it’s pretty durned good.